UMP | University of Minnesota Press Blog: Jay Weiner on Election Day 2010: Anyone ready for a recount? Jay Weiner on Election Day 2010: Anyone ready for a recount? From The New Yorker to the Star Tribune bestseller list, author and MinnPost reporter Jay Weiner's new book This Is Not Florida: How Al Franken Won the Minnesota Senate Recount has been getting a bit of attention. We recently checked in with the author to get his input on the current election atmosphere. As Election Day 2010 approaches, the possibilities of recounts across the nation looms and the emergence of Sen. Al Franken as a Democratic fundraising and campaign workhorse is clear. Not to place or name drop, but we had a This Is Not Florida book launch party in Washington, D.C., last week. There, a bunch of election lawyers, government agency staffers and inside-the-Beltway know-it-alls gathered. While the context was the 2008 Franken–Coleman recount, the real chatter was which U.S. Senate races and which House seats would trip into the recount zone. Your humble author, of course, is rooting for recounts from Maine to Arizona. Many of the lawyers at the cocktail party at Johnny’s Half-Shell – on the first floor of the same office building as Fox News!! – were also preparing for recounts. That’s how many of them make their biggest paydays every two years. For now, the race that everyone is looking to is the Nevada Senate battle. That’s where Majority Leader Harry Reid is in a too-close-to-call campaign with the very conservative challenger Sharron Angle. In a bit of historic irony, a younger Harry Reid was involved in a recount in 1998, and a couple of the key characters in This Is Not Florida, such as Marc Elias and Chris Sautter, were part of Reid’s legal team. One would have to assume that Elias and Sautter would be on the ground in Reno if this race goes into recount overtime. On the House side, Real Clear Politics, the superb website that monitors elections, has listed 39 “toss up” seats in Congress. You can go to the Real Clear site and navigate through each race and see how close polls claim these races are. My view is this: the Democrats came into Minnesota in 2008 still smarting from the Bush–Gore presidential recount loss in 2000; you can bet your bottom dollar the Republicans will come into any 2010 recount kerfuffle smarting royally from the Franken–Coleman defeat. Whatever recounts get going next month, the cloud, the lessons, the anger, the power of the Minnesota recount will hover above and around them. Meanwhile, it looks as if Sen. Franken is hitting his stride. Remember, he didn’t get into his seat until July 7, 2008, a full six months after everyone else in his new class of senators. He vowed then – and was advised then – to keep his head down and get to work, shedding any celebrity baggage he brought to Washington. And Franken did just that. Get the full story from Fox News. Franken has also been mentioned as a “darkhorse” candidate to be the new chairman of the Democratic Senatorial Campaign Committee because of his mind-blowing ability to raise money; after all, for his 2008 Senate run and recount, he had to bring in more than $30 million. When Election Day comes around, and a dozen or more races are in the recount zone, you can be sure that Franken’s name will be repeatedly invoked. He is the poster boy for a candidate who allowed the pros to oversee his recount. Franken won and, two years later, he’s become a real player on the Washington scene. 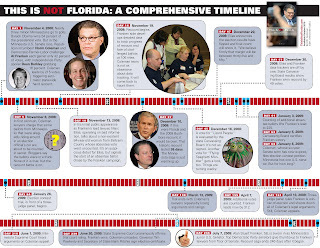 Track the entertaining play-by-play of the Franken–Coleman recount in This Is Not Florida. You can also find event photos and quiz questions on Facebook, or download an infographic timeline of events (below) and a readers' discussion guide.